A wireless port will provide 4 independent queues & in contrast a wired port will provide upto 8 queues. This 8 queue models will closely align with 4500/6500 queuing architecture & therefore much easier to align with QoS policies. Basic architecture of this platform provides 24x1G access ports & 2x10G uplinks per ASIC (Application Specific Integrated Circuit) to 120G stack connection. (In 48 port switch has 2x ASIC). This also provide two seperate internal queues over the stack ring, giving access to the priority traffic & non-priority traffic. Ingress queuing is not configurable. Below diagram provide basic stack architecture of this platform. In Egress Queuing, we can discuss this as Wired Egress & Wireless Egress queuing separately as queuing model is different in each scenario. Egress wired queuing on the 3850 can be configured as 8Q3T, 1P7Q3T or 2P6Q3T. Since first one does not have priority queuing it is not recommended. If your core/distribution is having 4500/6500 platforms both share the 1P7Q3T model, so if you using 3850, you can easily align policies with your core/distribution. 1P7Q3T : Below diagram illustrate the 1P7Q3T egress queue mappings for a 3850 using 8-class model. The recommended buffer allocations for wired interface queues 7 through 1 are 10%, 10% 10%, 10%,10%, 10%,25%. By using “queue buffer-ratio” command you can configure this. Below show the corresponding configuration for an 8-class 1P7Q3T egress queuing on a 3850. 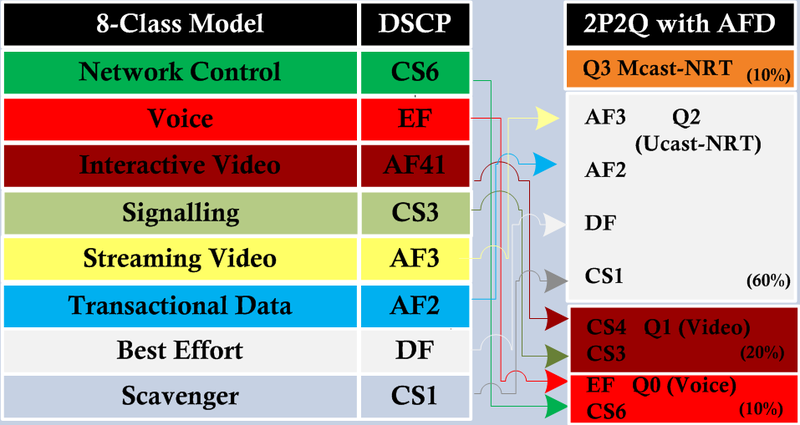 2P6Q3T : This model only differ slightly from the previous one as it has been extended to cover 12-class model & the addition of a second priority queue for seperation for voice & video. 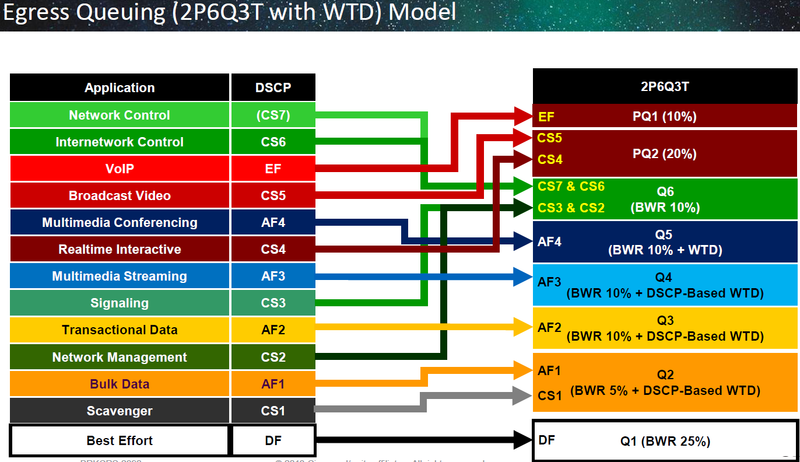 Below diagram shows the 2P6Q3T egress queue mapping for catalyst 3850. Below show the corresponding configuration for an 12-class 2P6Q3T egress queuing on a 3850. 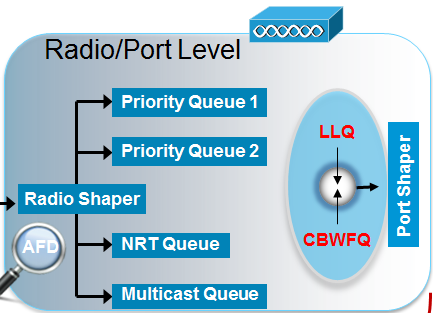 2P2Q : The wireless queuing model is a 4 queue structure of which two are strict priority using for Voice & Video.The other queues are “class-default” or NRT (Non-Real-Time) & Multicast Queue (non-client-nrt-class). If your multicast traffic is marked as CS5, then it will go to the priority queue, so only multicast traffic marked as non-real time goes into this queue. When scheduling, strict priority queues are fully serviced ahead of all other queues. When configuring more then one priority queue, only when the first priority queue has been fully serviced, scheduler will go to the 2nd priority queue. A strict priority queue is enabled with the “priority level x” command in policy map configuration. For the other two queues (class-default & non-client-ntr-class) scheduling is based on CBWFQ (Class Based Weighted Fair Queue). Below diagram illustrates this. 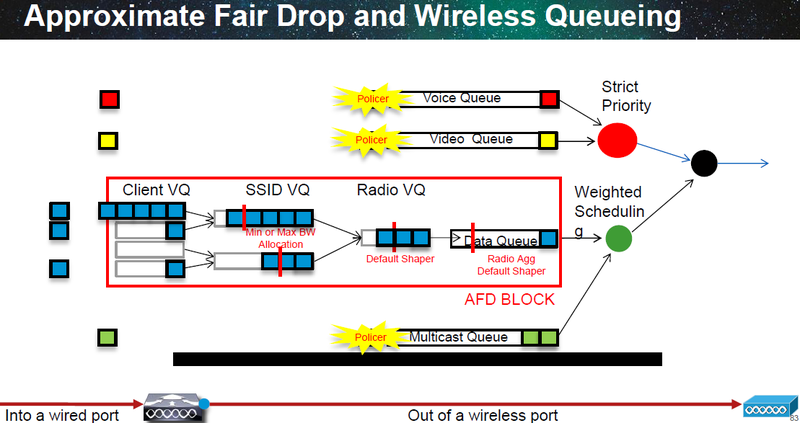 Below diagram shows 2P2Q wireless egress queuing model. You can verify the policy-map configurations available on your 3850 switch using “show policy-map” command. As you can see “port_child_policy” policy-map is there with 10% bandwidth allocation to “non-client-nrt-class” class. 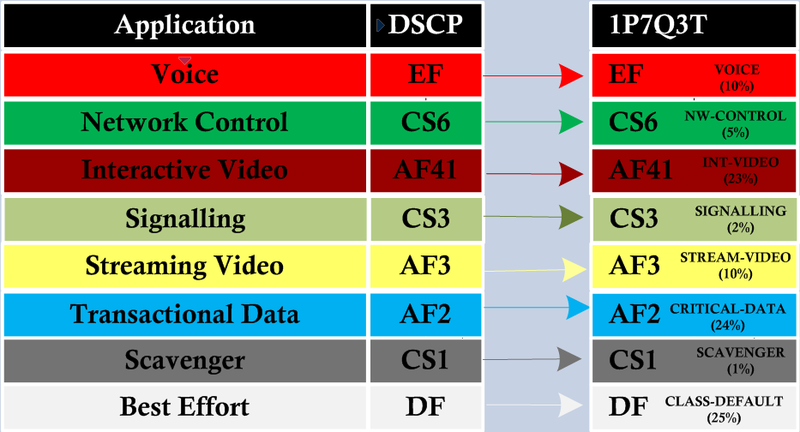 Let’s define two class maps named “VOICE” & “VIDEO” which will match DSCP “ef” & “af41” respectively. Then we will allocate 10% & 20% for those traffic & make them go via priority queues as shown in the above 2P2Q model. Also allocate 60% of the bandwidth for the “class-default” class. This policy map is applied automatically by the WCM (Wireless Control Module) to all wireless ports (a port where an AP is directly attached). You can verify the policy configuration using “show policy-map” command. You can verify this policy is applied to wireless ports automatically. In my case I have two APs connected to G1/0/1 & G1/0/2(so those are wireless ports). You can see the Radio & AP level QoS as shown below (since they automatically applied). In next post we will see how to configure QoS on switchport where they play different roles & how to verify those configuration. Hi, first of all thanks for this great article regarding QoS for the 3850. I just have an inquiry regarding 1P7Q3T, if I use that, will I be tied to using 8 exact classes of traffic? I’m actually trying to migrate QoS from 3750 to 3850, and currently our implementation on the 3750 contains10 classes of traffic. Thanks in Advance for your response!!! Yes, you can define max 8 class-maps. But you can classify different traffic onto single class by using multiple match statements. In your case you need to consolidate few classes if you are using 1P7Q3T model. Hi again, Just to clarify, since this is just a suggested QoS model. I will be actually allowed to modify it, like create 10 class-maps and just adjust the necessary bandwidth to make it total to 100%. Will that work? Thanks again! Since in hardware level only 8 queues available for a 3850 switchport , when you configuring classes under service policy it will allocate a queue to each traffic class. So to have more classes than the number of queues available makes no sense. Hi again, thanks for the help on this. Follow-up question, in your 1P7Q3T egress queuing example and as stated in your blog. Queueing is applied thru service-policy now, unlike before where in we use the command priority-queue-out on a egress switchport. My question now is, can I apply another service-policy (service-policy input) for marking? Is that the correct implemenation? coz in the past, the config is like the below. So now, my idea is there needs to be 2 policy maps created (1st for egress / 2nd your normal policy-map for marking traffic) But I read somewhere that I can only apply a policy-map in 1 direction. Please correct me if I’m wrong. If it would not be too much to ask favor on this, can you give me like a sample working complete QOS config for a 3850, I would really appreciate it. Thanks again! Yes, classification service policy you can apply input direction as you do in the old switch platforms. You are correct in the above. Classification service policy ingress & queuing service policy on egress. Hi, Sorry to bother you again. May I ask if you can check if my proposed QOS converstion to a 3850 is OK. part 1 is the existing 3750x QOS, then part 2 is the proposed QOS converstion for a new 3850 switch. Many Thanks! Hi, Is egress queueing suggested only to be applied to uplink/trunk ports? Or is it still needed to be applied on access ports ? I would apply it for all the ports including access ports. It’s really a good article. I’m setting up 3850 for iSCSI only for Equallogic SAN and i know dell has suggested the following mls qos commnds on 3750, but as 3850 doesn’t support mls qos command. Can you please help me with an equivalent config on 3850. below are the QOS commands on 3750. Also As i don’t use this switch for any Wireless in this case. Do you know how i can clear up the default wireless related stuff from the 3850 switch? leaving the default config as it is effect my iSCSI?. I really appreciate your help. Did not have time to look at this in detail. Regarding wireless stuff, by default it is not enabled. So you do not want to do anything on that. I will be replacing our 3750x stack with a couple of 3850’s and was just wondering if I have to use and configure all 8 queues or can I just model the 4 queues similar to what we have on our 3750’s? Also I believe I will have to setup an output policy since 3850’s doesn’t support SRR for egress queueing, will I have to create class-maps for all the classification where on the 3750’s it is configured on the port such as “srr-queue bandwidth shape 8 0 0 0”? We will also have AP’s and a wireless controller on these new switches. Will wireless traffic automatically use the default QoS since we are not using the wireless controller portion of the switch? You can use 4 queue models if you want.In that case you need to define your class maps accordingly to use those 4 queues. By default these switches trust DSCP or CoS depend on the switch port configuration. So AP connected switchport will trust DSCP as those configured as access port & WLC connneTrunk. If you are not using WLC functionality of the switch then you cannot apply same QoS policy for wired & wireless as traffic from AP to WLC will be CAPWAP encapsulated. Great detailed posts and informative resource! c)	Each Queue sizing parameters should be optioned for the specific 1P7Q3T queuing model. I trust that this post is in order. Fantastic resource and i have ordered the recommended Qos book. Just one query to the Signalling allocation. 1P7Q3T for Wired; The recommended buffer allocation for wired interface queue 7 to 1 are 10:10:10:10:10:10:25 in percentage (%). receive the recommended buffer ratio values. I just queried this as the signalling class in your post does not show the buffer ratio 10:) (sorry, i am not looking for mistakes here just try to fully learn and understand the subject. Again your resources are amazing! according to your below configuration, can you please define the class map configuration that you are using, and also shall we apply this policy map on access and trunk port and in which directions? and what to do on the distribution switches if it is a catalyst 6800.?? ?